Here’s the promised post about when people finding and football intersect. It’s nothing without pictures! Recently, a friend who runs the Phoenix of New Orleans e-mailed me to see if I could find updated contact information for some people who were candidates to have their Hurricane Katrina damaged homes rebuilt by the organization. Using techniques I demonstrated in class Tuesday, I found them, and ultimately a family was chosen. Obviously, I felt great about it, but what I didn’t know at the time is that the project was being funded by Jahri Evans, Lance Moore, Malcolm Jenkins and Roman Harper of my beloved New Orleans Saints. As such, I was invited out to dinner with them after Sunday’s conquest of the Houston Texans. WHO DAT! 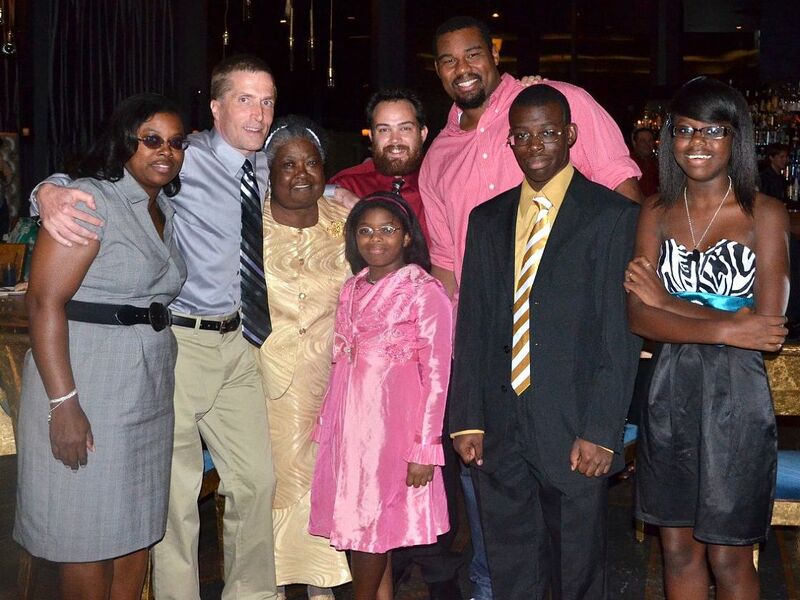 With Saints guard Jahri Evans, PNOLA's Jim Coningsby and the Rush family. Woo hoo! We’ve got bylines! The latest from the Mott Haven Herald includes Claudia Bracholdt’s story about problems at Samuel J. Gompers High School, Gwen McClure’s piece about plans to expand services at a neighborhood health center and Sarah Pizon’s feature about a shipping company that specializes in sending packages to West Africa. Posted in Student bylines | Comments Off on Woo hoo! We’ve got bylines! People—whether witnesses to an incident or experts on a subject—should be one of your first thoughts as a source of information on ANYTHING. That said, never trust any person—no matter who it is—as your sole source of information, even about him or her self…and sometimes ESPECIALLY about him or her self (e.g. people lying about their age). Always verify! Backgrounding people is crucial. For example, you never want to write a friendly story about someone, only to be burned by not doing proper backgrounding. Last but not least: there’s some information generated about people that won’t be available. As an example, consider Presidential candidates. What information about them is released only at their discretion? The bonus: The J-school has two new premium resources not on the lesson handout. Accurint is an amazing resource that Barbara Gray has access to in the Research Center. Spokeo is one you can use yourself with a username and password. Don’t skip questions. You’d think this would go without saying, but based on past experience, it needs to be said. If you’re having problems with a question, ask us for guidance. We won’t give you answers, but we will try to point you in the right direction. This is not like my final research quiz, where in the interest of time I do suggest skipping questions that give you too much trouble. In this case, you have more than enough time to overcome problems. Whenever possible and wherever applicable, we want you using primary sources to answer questions. There may be some that require the use of secondary sources, but sourcing answers from other media outlets is not permitted. So no links to newspaper articles or the like. That’s not to say you can’t scan articles to figure out where those outlets got their information, but then you have to go to the primary source and get the info yourself. Speaking of links, whenever you get information from an online source (especially statistical data), provide a DIRECT LINK to that information in your answer. For example, sourcing an answer as just “NYC.gov” or even the department on NYC.gov is not acceptable. If for any reason providing a direct link is not possible, give step-by-step instructions on how to get the info online. (Sometimes this is necessary with searchable databases.) All that said, not every question is designed to be answered with an online source, so for those, you obviously don’t have to be concerned with providing a link. Some are more of the “reporting” variety and others are more of the “research” variety. It will be up to you to determine which is which. Show us that you can get your boots on the ground as well as your fingers on a keyboard. And don’t be afraid to make phone calls either. Some people are too averse to that. There are some questions that are common to everyone and others that are specific to your beat. As such, the latter are of greater importance to your individual beat memo grades. Last but not least, remember that my lesson and the accompanying handout posted here August 29th were designed in part with the beat memo in mind. So you’ll certainly want to peruse those, as well as the related post by Barbara Gray. After yesterday’s class, I just wanted to make a point on crime reporting that I felt may not have been made clear. That is, there are still important stories to be written after the gritty details of individual crimes have been reported. I want to defend the “feature” stories that may be written a week out, or even later. For example, I would contend it’s impossible to put together a very good profile of a “perp” within the first 24 hours of a crime. What makes him (or her) tick? Why might he have committed the crime? Answering those questions is going to require research and talking to as many people as you can after the initial chaos of a crime has subsided. You’ll be writing a profile story soon. As another example, there are crime “trend” stories that require the same kind of time investment to do properly. Is a certain type of crime on the rise? Is it a bigger problem in a specific geographic area? Why? You’ll need statistical evidence and expert opinion to detail and explain the trend. This second kind of story would fall into the “enterprise” category, which is another of your assignments this semester. So while it’s great to beat the competition on the details of a crime, that’s not the end of crime reporting. Some of what I’ve already taught and will be teaching in upcoming lessons will be particularly useful for those profile and enterprise “feature” stories. Think about how you might find these items today. Remember yesterday’s Factiva search when I used only the Libyan leader’s first name because there are so many different spellings of his surname? I said using the “atleast” command to narrow the results of that search would be difficult, but for that specific search in just two sources (Reuters and WSJ), I now realize I could have used it without much trouble. After I got my initial set of results, I could have scanned the stories to see what surname spellings those sources use, and assuming they spell the same way all the time, gone back and plugged them into an “atleast” command, such as atleast6 (gaddafi or gadhafi). Or in this case, since the two sources use similar spellings, atleast6 (gad?afi). The ? wild card character should work here because it represents the fourth character in the word. Our problem yesterday with m?ammar was that Factiva didn’t accept the wild card as one of the first three characters in a word. But again, this is only because I was searching a limited number of sources. Had I been searching all sources, which would have many more different spellings of the surname, using the “atleast” command becomes tougher.